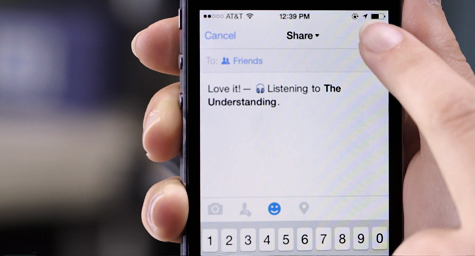 To get its users to share more about the things they care about, Facebook is introducing a new feature that can include status updates about the songs or shows that the person is presently enjoying. The new feature is designed to help friends become more familiar with their friends’ lives and loves. To protect each person’s privacy, the feature must be activated by the user and is turned off by default. To show how the new feature can create more meaningful friendships and mean a lot to marketers, The Daily Mail shared all of the details. According to Aryeh Selekman of Facebook, people have shared more than five billion status updates that have included these types of feelings and activities in the last year alone. The company created the feature to make it much faster and easier to share these snippets of personal information and let friends discover new favorites. Now, users who have opted in for the feature will be able to use their phone’s microphone to say the song that’s playing or the show they’re watching. Then that information will automatically appear in the status update posted to their News Feed, simply by talking rather than typing. Any songs that are shared will include a 30-second sample, while TV shows that are shared will list the season and the episode. Best of all, the sender has complete control over which people can see these sharable snippets. While the feature is made to help friends get to know each other better, it’s also useful for marketers looking to learn more about consumers. And Facebook wants to be the place where marketers spend their time and money finding that information. So to stand apart from Twitter and other competitors in the minds of marketers, this is Facebook’s second feature this month that can derive this type of marketing data. The new feature will be available for iOS and Android devices in the U.S. over the next few weeks. Find out what’s new and news in social media. Contact MDG Advertising today at 561-338-7797, or visit mdgadvertising.com.